At the recent NARI® The Cutting Edge Remodeling Education Expo in Atlanta, I was honored to present my course on Making More Sense of Social Media to remodelers. Before mine, I attended David Lupberger’s presentation which was on Selling the Why – Communicating Why Potential Clients Should Hire You. I always like to “walk the track” before any presentation I make by attending, if I can, the one before mine. It gives me a sense of the audience, helps me understand how to adjust my delivery points, and generally, puts me in the right mood to put on a good show. This is exactly what happened; Lupberger’s presentation was the perfect prelude to my own topic. Lupberger (http://www.davidlupberger.com/) discussed how remodelers should survey their customers and prospects on a continual basis, on why they win or lose a project, and how to use the results to promote their business and differentiation. Lupberger, an author and speaker who worked in remodeling for many years, offered advice to his audiences about building client relationships. Tips like “manage expectations” or “reset the table” within his presentation encouraged his remodeler audience. Lupberger’s message was based largely on Simon Sinek’s TED® talk about Why, which Sinek gave in 2009, and for which Lupberger duly gave full credit. Sinek’s presentation was a 17 minute talk worth your time if you haven’t seen it. The premise – people don’t buy What you do, or How you do it: they buy Why you do it – is a thought-provoking idea. He says companies often pitch How and What, but neglect the Why; more successful companies pitch the Why first. His premise is grounded in biology (the brain). Sinek’s golden circle – Why, How and What which he copyrighted — correlates to the brain’s organization (in his opinion). But selling the Why implies that’s what people buy. Do they? What is, exactly, the “Why?” It sounds good, logical, intriguing. But is that really what happens in a sales transaction? What does “selling” really mean? When you buy your groceries, are you buying because of Why, or because of What you want to eat or How you are going to cook the item? Are you buying all three? Some people who sell the Why are selling smoke. Remember Bernie Madoff? I wrote a blog awhile back called, “Why You Should Shoot Messengers” which discussed Mr. Madoff who at the time wrote a letter to CNBC. I was surprised a friend of mine recommended reading that letter or anything this con artist said, but I did and wrote the blog. Here is piece of it which is about buying and selling Why. I remember reading a piece in The Wall Street Journal called, “Why We Keep Falling for Financial Scams” by Stephen Greenspan. Greenspan is a smart guy – an emeritus professor of educational psychology at the University of Connecticut and author of “Annals of Gullibility.” In the article, he admits that, “After I wrote my book, I lost a good chunk of my retirement savings to Mr. Madoff, so I know of what I write on the most personal level.” He uses himself as a case study, “to illustrate how even a well-educated (I’m a college professor) and relatively intelligent person, and an expert on gullibility and financial scams to boot, could fall prey to a hustler such as Mr. Madoff.” I encourage you to read the article, because it’s really about greed – not gullibility. It is clear Madoff was selling his Why and people were buying it. But I think Sinek was talking about something different than smoke and mirrors. Like others before Sinek and others who will come after him, Sinek stumbled on a single idea that at the time was simple and easy to understand. He transformed it into a business. His formula sounded unique, but it has actually been around for centuries. The Why he is talking about is just another word for salesmanship. And the real question was then as it is now: what are we really buying – the What, the How or the Why? If you just buy the Why in business – or in life — you generally lose. Here’s why (no pun intended). A lot has changed since 2009 when Sinek formulated his idea. Today, it is the customer who is defining everything, including the Why. Customers today are exposed to many options well before the sales person calls, making the “pitch” – the Why –more difficult to execute. Pitching ideas and products has been around since we started on this planet. Sinek’s two examples –an iPhone and Martin Luther King– are vastly different in what the buyer acquires from the seller, but the technique of delivery of Why — the pitch — is exactly the same: salesmanship. 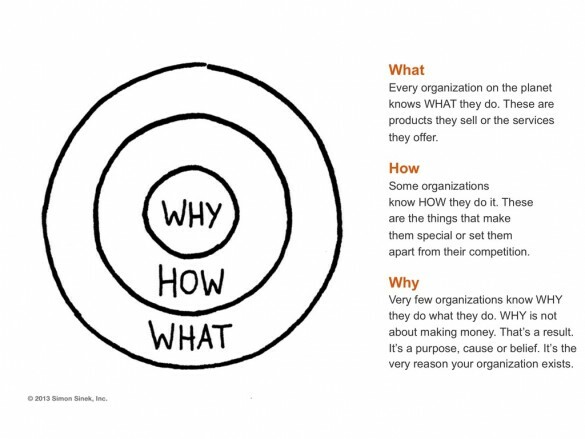 With respect, buying a device like an iPhone or buying into King’s philosophy may seem the same because of the emotion of the Why, but the only similarity of the Why is the pitch. The end result – what the person buys – is vastly different. One is a product, and the other is an idea. If buyers can’t distinguish between products and ideas they are being pitched – if they buy strictly on the Why – they may get taken like Greenspan did by Madoff. Or, if they simply buy the Why, they may think they are buying something, and when the transaction is over, they get something else. We all get pitched. And we all buy into the Whys at different times in our lives. But if everyone is selling with Why, something else happens: they begin to blend into each other so you can’t recognize one from the other. In other words, if we’re all selling the same Why, then it’s really the What and the How that will help me differentiate from one offer to another – right? Remember: there are a lot of good pitchmen around. I’d say that sums up the Why fairly well, don’t you? The world was very different in 2009. That was the year governments in the US and around the world poured trillions of dollars into the financial system and economies to avert a Great Depression. Hundreds of thousands of people lost their jobs. It was a very emotional time. I remember reading headlines in WSJ about fear gripping everyone. We needed something to believe in, and selling the Why made a lot of sense. It still does, but it’s not new. Furthermore, because everyone started searching and selling their Why, there are a lot of Whys now to choose from. Notice that Apple still has not found anyone of substance to claim the Jobs’ Why. The nature of Why that Sinek was talking about is a brand’s essence, and while each brand has an essence, there can be only one essence per company. And if everyone is preaching “We make your dreams come true” as they discussed in the room that day at NARI, well, how is a customer supposed to distinguish between those pitches? The problem with just going for the Why is you still need differentiation. Even when you are pitching deep ideas, without differentiation, they all sound similar. Differentiation, as it turns out, is the realm of What and the How. If five people pitching are emotional with equal gusto in the pitch, how does one differentiate? Al Ries & Jack Trout in their great book on positioning noted that, ”The first brand into the brain, on average, gets twice the long-term market share of the No. 2 brand and twice again as much as the No. 3 brand. There are enormous advantages of being first.” And being first with the Why is the advantage in ANY market. But once that market has their first, second and third Why, companies have to really start to think about their How and What to differentiate (once they figured out their Why). Bob Stone one of the great direct marketers of all time once said that people buy something for only two reasons: to protect what they have, or to gain something. The Why has something to do with this behavior but it’s not the only thing that governs this behavior. In this age of the customer we live in, it is the buyer who is defining the transactions, which means, because so much information is available about What and How, the Why doesn’t mean as much as it does. That’s what information does: it educates people and makes them less susceptible to the pitch. It’s not about you; it’s about them. Sinek was right: selling the Why is important. But it’s not just about the Why anymore because of the way information flows these days. Respectfully, I would suggest you need to see all three these days, and that leading with the Why will perhaps turn more people off than turn them on. May wife and I stopped into a rug dealer in town to buy a throw rug for the front door. The sales people were dressed in suits, and they watched us carefully as we walked through the showroom. In about five minutes, one of them walked up to me and said, “Do you know anything about such carpets?” “No,” I said learning quickly they are not rugs, but carpets. “Let me show you,” he replied, and snapped his fingers and four workers ran to a stack of rugs, pulled the first five off and brought the sixth over to us, unfolding the large rug in front of us like rolling out the red carpet. The workers had worked up a sweat. “I understand,” he said, and then he knelt down next to the carpet. “Here, let me show you. Feel this.” As I knelt next to him, he began telling me about the village in Iran where this rug was made. He told the story slowly, with emotion. Words like “I know people in this village…they have been doing this for hundreds of years…you can feel the quality.” Then, he stood up, snapped his fingers and the workers repeated their exercise, this time from a different stack. “Here,” he said after the unfolding, “let me show you the difference between the other one and this one, which is from China. It’s still a quality carpet, but it’s different.” And he told me how different. For 20 minutes we looked at carpets and I learned more perhaps than we wanted to know. But we walked out with the larger one for our living room, and the one for the front door. Salesmanship is education, teaching, weaving that “emotional fabric” around which a transaction can take place. The carpet salesman used the How and the What and never had to mention his Why. It was in the story, in his expressions, in his gestures. And that’s where it always resides. Today, more than ever before, we shouldn’t neglect the What and the How in favor of the Why. “My sense is that human beings just don’t trust anything or anyone these days. They don’t trust the government. They don’t trust media. They don’t trust social networks. They certainly don’t trust vendors, sales reps and marketers. They trust their friends and family. That’s kind of the only people — that’s the only real loud voice in their heads. And so as trust goes down, I think word of mouth goes up. And that’s just the way life works these days, and that’s the way — I don’t buy any products unless my good friend Mark or my good friend Chuck recommend them or my family or my friends. It’s just life in the big city. Word of Mouth (WOM) has always played an important role in B2B. Our own studies showed us that facility managers, architects, designers – all the professional people talk to each other, not just about family and friends, but about products. They become, actually, part of “selling the why” because they used and believe in your product. Or they don’t. Today, perhaps more than any other time, selling the why must be preceded or co-mixed with the What and the How. In fact, the Why is almost always done by other people, either selling a product, a concept, or a belief system. It’s called advocacy, and advocacy, more than anything, is the essence of any Why. Thanks for reading! Let us hear from you. David, great comment. Thanks so much. And you are correct…we’re on the same page about the intangibles. But the carpet guy used the How and the What to frame the Why. Talk to you soon and see you around the circuit. Selling your why correctly allows a salesperson to differentiate their product or service. Understanding your why allows a salesperson to highlight their unique approach, attention, or commitment that they can offer to a prospective customer. It is intangible, but these intangibles are reflected in the day to day business practices of a good vendor or salesperson. You experienced that first-hand with your rug dealer.